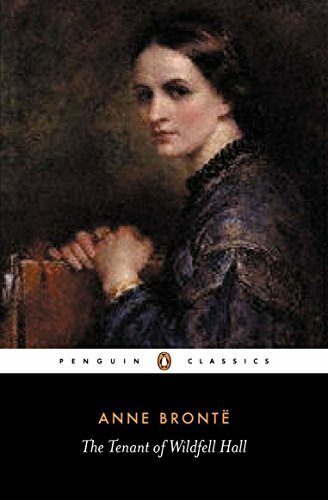 I read Anne Bronte's The Tenant of Wildfell Hall as a plea for women's right to self-determination. I didn't quite expect to read it that way; I hadn't realized before that the novel had such a strong feminist message. It also contains an utterly realistic portrait of a man on the downward spiral of alcoholism. The novel is comprised of three parts. In the first, Helen, a widow with a young son, appears in a rural village and rents an isolated mansion. She refuses to satisfy the curiosity of her neighbors about her origins, and soon becomes the object of malicious gossip. The second part consists of her diary, which details her marriage to an emotionally abusive alcoholic and her eventual flight from him. In the third, the story lines are resolved and all characters get their various desserts, good and bad. In a time and place in which everything a woman possessed became the legal property of her husband, and in which she was expected to obey him in all matters, and in which there were no socially acceptable grounds for leaving him, this book must have seemed incendiary. Certainly her behavior is tame by today's standards--the husband's moral degeneration and hatred of his wife are chilling, and her forbearance is saintly and lasts far longer than he deserves. She finally removes herself and her child from the toxic atmosphere, but does not seek divorce, and returns to nurse him through his final illness. She refuses to speak ill of him or allow anyone else to do so. This is the crux of the book, I think--that in Helen's society, women did not have the legal right to make even the simplest decisions regarding their own persons, once they were married. Isn't that a great book?? I love it. Indeed Helen is amazingly saintly, but that's what was expected...and, also, of course Anne Bronte needed her to be absolutely irreproachable in every way. It's so realistic. Love that book. Am incoherent now. Yes, you're absolutely right--Helen had to be saintly so that readers couldn't write her off as a bad woman and not pay attention to the injustice. I've read Agnes Grey by the same author and this one sounds fascinating. Can't wait to try it. Thank you! I loved it too. Reading your review I cannot help but think about the difference between Helen and Emma Bovary. They were complete opposites! Emma: over excitement of emotions, senses and imagination and complete disregard for her role as wife and mother. I haven't read Madame Bovary, so I can't speak to that character. But Helen, as Jean pointed out above, was drawn with an extreme (to me at least) almost superhuman saintliness, and this was necessary in order not to alienate the reader of the day, so that the book's protest against the subjection of women could be felt. Without having read the book, I wonder if Emma was drawn as the opposite extreme for some similar purpose--to make some point about marriage or the social system of the time. Or is it more a character study of this woman only? What do you think?